"Wind River": Jeremy Renner as Cory Lambert. In the hard-boiled stories of Taylor Sheridan, human beings are just another commodity on a trading platform that equates them with money or oil or drugs. He wrote the scripts for Sicario and Hell or High Water, the latter nominated for Best Picture last year, and now he's back with Wind River — directing, for the first time, his own script. The screenplay has some Taylor touches: smart dialogue, likable neo-Western heroes in cowboy hats, sudden open-carry shootouts, a capable woman navigating a man's world, some searing social commentary. As a director, though, rookie helmer Taylor gets lost trying to assemble these elements into a tight package, and has an especially tough time reconciling his own internal instincts for complex themes and genre elements, which came together so beautifully in Hell or High Water. 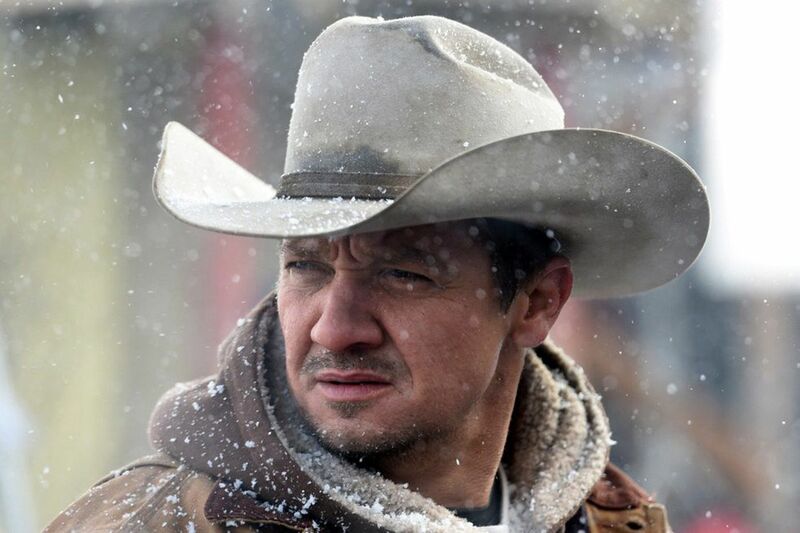 Wind River stars Jeremy Renner stars as Cory, a game warden who married a Native American woman (Julia Jones) and works on a Wyoming reservation as a hunter, tracking and killing wolves and cougars that prey on livestock. While on the trail of one such predator he finds the victim of another. A local Indian woman is dead in the snow after fleeing from the scene of a brutal sexual assault, the location of which is a mystery because a blizzard has erased her footprints. Cory knows her, though, and knows he's going to have to inform her father (Hell or High Water's Gil Birmingham). The FBI arrives in the form of Jane, a bright but overmatched young woman (Elizabeth Olsen), whose initial city-fied fumbling amuses Renner and local tribal law enforcement (Graham Greene). In time, Cory and Jane agree to work together, following a twisty trail that eventually leads to the perpetrator, but in the interim pauses to look at the problems of drug abuse, unemployment and negligence that plague the reservation. It's the latter that animates Sheridan here. Violence goes uninvestigated, women go missing, and crimes are never solved because the lives of those on the reservation are nobody's priority. In fact, they take a back seat to other things happening on the land, and anyone who follows the socioeconomic subtext to Sheridan's work can probably guess where the narrative is headed. The crimes here are both systemic and personal, and Sheridan reveals both a late-breaking series of flashbacks — The Walking Dead's Jon Bernthal turns up — that presage a climactic shootout in a snowy wasteland, wherein the violence simmering underneath the movie's surface suddenly erupts and engulfs everyone. It's here that Sheridan's genre instincts get the best of him, and Wind River gives way to lurid exploitation. The hail of bullets somehow spares the story's most heinous character, who is conveniently left alive so that he can serve as a (literally) sniveling avatar of hatefulness and we can all enjoy his comeuppance. It is gruesomely enjoyable, but it belongs to another movie, one that doesn't have Sheridan's larger and more serious ambitions. Directed by Taylor Sheridan. With Jeremy Renner, Elizabeth Olsen, Graham Greene, Gil Birmingham, Jon Bernthal, Julia Jones. Distributed by The Weinstein Company. Running time: 1 hour, 41 mins.